Although it might seem intimidating to implement your own promotions amid so much competition during the holidays, it promises to be rewarding for businesses that employ smart tactics. Every upcoming holiday has the potential to be a significant marketing opportunity. Whether it’s the Fourth of July, Valentine’s Day, or even Groundhog’s day, it’s a chance to tailor your marketing message and reach out to your audience to get more traction. Although it might seem intimidating to implement your own promotions amid so much competition during holidays, it promises to be rewarding for businesses that employ smart tactics. 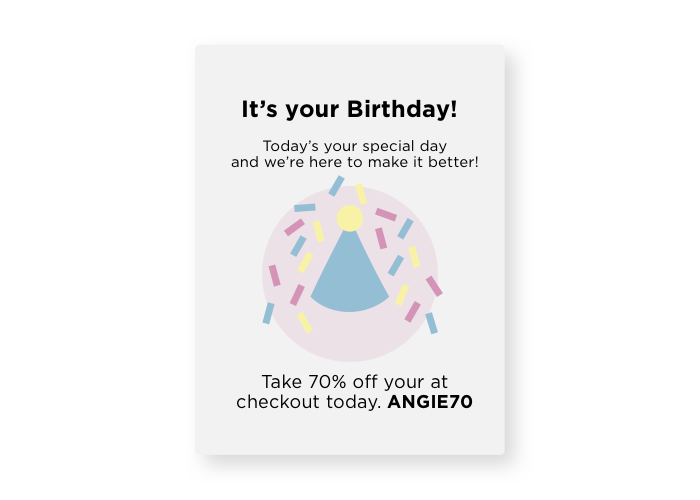 Holidays and birthdays are about gift-giving, so why not send a select group of customers or leads a promo code that’s unique to them? 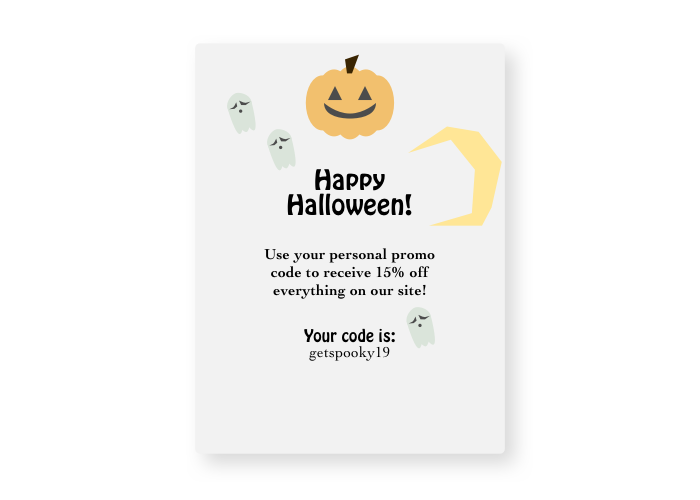 With a personalized promo code campaign, you can show your recipients that you value their relationship by giving them a special discount or free item. In Ontraport, you can choose from two varieties of coupon codes: personal coupons and group coupons. Personal coupons are single-use coupon codes that are restricted to a specific contact, so no one else can use them. These codes can be delivered via email, SMS or postcards using the familiar merge field function. Example: Hey Angie, happy birthday! Here’s your code for 70% off. ANGIE70. Group coupons are a general code you can customize for mass consumption. You can use these to target a specific market or channel, or award existing customers with a general discount. These codes can be posted publicly or privately on websites, Facebook pages, or in PPC ads or delivered via email, SMS or postcards. Example: Ah, Valentine’s Day. Love is in the air — and so are ladybugs. Use coupon LUVBUG for 20% off a ladybug t-shirt. The main difference between the two? Group coupons allow you to reach the widest audience with your promotion, while personal coupon codes have the added benefit of creating exclusivity for your recipients because the code is only good for a one-time use. Shopping for any upcoming holiday usually revolves around a fixed deadline of the actual holiday, so there’s already a natural sense of urgency built in. You can make the most of that urgency by designing time-sensitive campaigns that expire on a particular day, then display the time that customers have left to take advantage of your deal on an Ontraport Page. Throughout the holiday month, your customers’ email inboxes are filled to the brim with messages promoting deals, greetings and purchase shipment notifications — so why not think outside the inbox? Everyone likes receiving holiday cards, so a great way to engage with your customers is to send them some personalized mail. Dealing with mail merge, choosing a local print house, and manually addressing and stamping each message is time-consuming, but you can save time and still send your customers personalized messages using Ontraport’s built-in postcards. All you need to do is design a festive postcard template, use merge fields to personalize your message, and schedule your holiday postcard send. 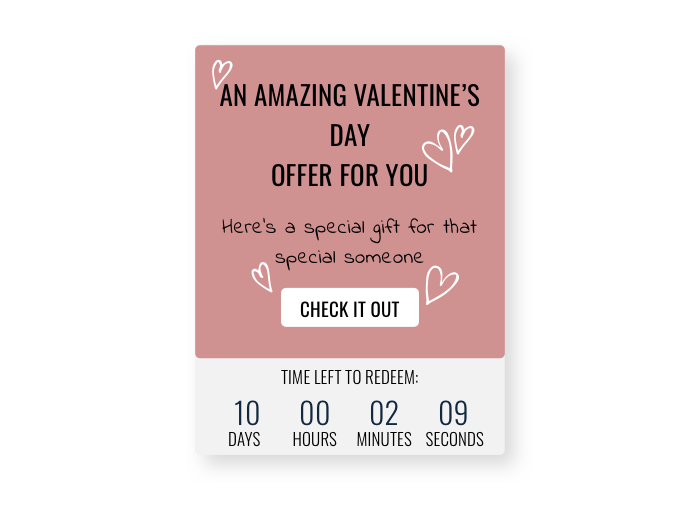 As an extra bonus, you can add a coupon code (either group or personal) to your postcards to take advantage of the spike in customer engagement and solidify their loyalty for the coming year. As you prepare for a holiday traffic surge on your web pages, think of all the extra visitors on your site as an opportunity to learn more about your audience’s behavior and preferences. During any holiday, you can get more valuable information about how your audience responds to different marketing tactics by running a few extra split tests. For example, if you’re planning a holiday email marketing campaign, test two different email subject line and pre-header combinations to see which performs best. If your data reveals a winner, apply what you learned to the rest of your seasonal emails for a lasting boost in engagement. If you’re aiming to drive more sales conversions for your product, you can experiment with different headlines and calls to action on your sales page or, if you’re feeling very adventurous (and you have a large audience), different pricing or product configurations. During this seasonal push, be sure to check your performance frequently and adjust your tactics based on what’s working in real-time to maximize your conversions. Many shoppers get caught up in the frenzy of gift planning and buying and exit the sales page before finishing their orders, leaving their cart abandoned. Every abandoned cart is a gift that many business owners fail to take advantage of: These people are some of the hottest leads possible. After shoppers abandon their carts, there’s a very short window of opportunity to reach them before they’re gone for good (potentially later buying their gift from a competitor’s site). Fortunately, Ontraport reacts automatically by monitoring prospects’ activity on order forms and reminding them of their unclaimed goods with the option of introducing a downsell or discount. Implementing a cart abandonment campaign is crucial to securing your holiday sales. Want to take extra steps towards avoiding abandoned carts? Establish trust on your transaction forms with trust logos, such as Norton Secured and VeriSign, that can persuade the shopper to complete the purchase. Offering multiple payment options, money-back guarantees, and a strong call to action on checkout pages have always been shown to help avoid cart abandonment. Don’t forget to be 100% clear about all costs upfront … especially shipping. Although it’s easy to get caught up in marketing around one major holiday, viewing it as a one-time chance to get the most sales possible, your efforts can have a lasting impact far beyond that day. Your goal should not be to generate as many new sales as possible during that time (although that’s a nice bonus), but rather to build awareness, engagement and loyalty that you can leverage throughout next year. To make that happen, formulate a plan to stay in contact with the new leads and customers you snagged during the holiday rush via a long-term nurture campaign. For example, create a campaign to follow up with customers who purchase for the first time because of your holiday promotion. Figure out what kind of logical next purchase would make most sense for them: Perhaps if they purchased a one-time-only product or service, you could upsell a subscription to them or sell them a larger package. Focus on taking that relationship to the next level by subscribing them to an email funnel that sends them valuable information to build that relationship over time, including strategically placed offers to strengthen the buying relationships. Thinking about holiday marketing tactics in the context of your larger strategy is critical. Although one lucrative holiday holds the promise of a large, one-time revenue spike, it can benefit you in longer-lasting ways as well if you focus on developing over time the relationships that are sparked during that time. Try something new. Even if you’ve been using the same marketing strategy for years, it’s never too late to test a new creative way to show loyal clients you care, warm up current leads, or bring in new leads. Use an upcoming holiday to your advantage and as an opportunity to test new ideas. What are some of your creative holiday marketing tactics? Let us know in the comments.